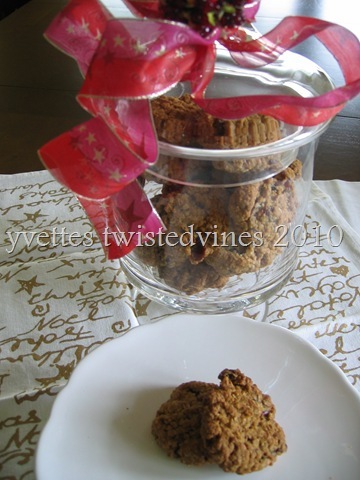 made oatmeal crunchy cookie,with succulent bits of cranberries. the cooler mornings and the sweet smell of baking in the kitchen. 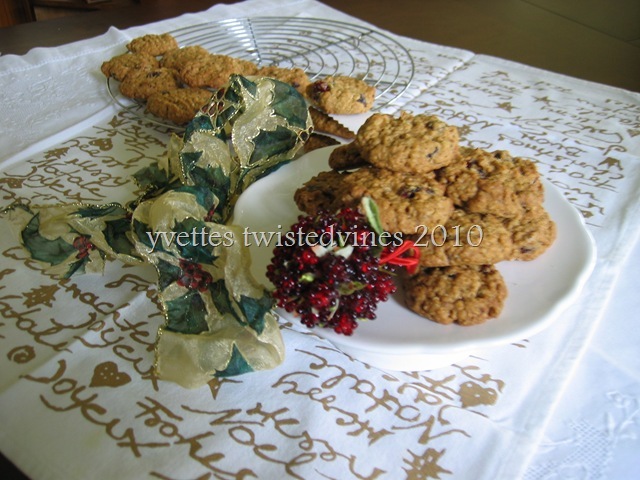 I found this recipe…The original recipe called for raisins, but I substituted dried cranberries for raisins, and cranberries also give that extra look of Christmas cheer. Beat the sugar and butter with electric beater until pale and thick. Add egg and vanilla and beat well. 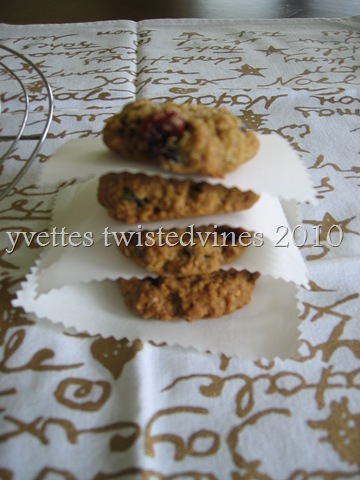 Sift flour and baking powder into butter and sugar mixture, fold through rolled oats and cranberries and mix well. Roll tablespoons of mixture into balls, place on tray and flatten with the back of a floured fork.Bake for 12 – 15 minutes. Cool on tray for 5 minutes and transfer to wire rack to cool completely. Will keep for 3/4 days in airtight container. These friends are a real treat,a great cookie to make. Keep them in mind as a great Christmas treat or a simple cookie to fill that cookie jar in the kitchen, or the lunch box. This recipe is included in The King’s Court IV: What’s Cooking Wednesday. The first thing I thought when reading your heading was “Ooh great Christmas idea”. A nice easy recipe too so these treats can be made all the time. Easy recipe yes,and full of flavour! Thanks for calling by! This is so perfect for my mid-morning coffee snacks; I had a recent bladder illness and have to eat lots of cranberries. Thanks Yvette! Cranberries are a great addition to any slice or biscuit..! Oh..how lucky are you…They’re actually hard to find here in Italy..I only know of one place to buy them,and only in dried form in small 200g packs.I always have to stock up for my Christmas baking! Thanks for calling by..a great quick recipe! Love substituting cranberries for raisins~ I’m wishing I had one (or three 🙂 right now to go with my coffee! You’re welcome any time, would also love to have coffee on your porch, by the watersfront! 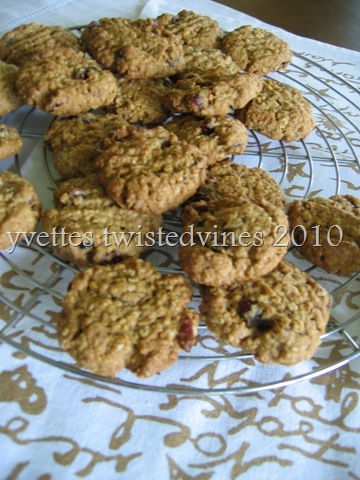 These oatmeal cookies are delicious and the cranberries remain plump and tasty! I love the new look of your blog. As always you have beautiful pictures and great food ideas! Thanks Cristi, alot of fun Wednesday’s sharing cooking tips and ideas! Cranberries, just love em… perfect flavor combination for fall. Your blog is just so enjoyable to read! Thanks for calling by mine! I love to buy extra cranberries at thanksgiving and freeze them! great recipe! Thanks for linking up to What’s Cooking Wednesday! Hope to see you again next week! Thanks Diane, will be there for sure, a fun time sharing!